See all the highlights of Vegas in a day! Discover the magic of vibrant Vegas on this fun, flexible bus tour covering all the iconic landmarks of the city. Relax on-board an open-top double-decker bus with 360 degree views. Learn about Las Vegas from our experienced and knowledgeable guides, who will point out the city highlights and tell you about the best attractions to visit and things to do in Las Vegas. Find out what makes Las Vegas so special. See the legendary hotels and casinos, Miracle Mile, the malls, museums and monuments, the 'Welcome to Las Vegas' sign, the Golden Nugget, Fremont Street and much more. Explore the city at your own pace on two great routes; hop off at any one of the 15+ stops to shop, eat, visit attractions and rejoin when you are ready. You can join the hop-on hop-off bus tour at any of the stops. 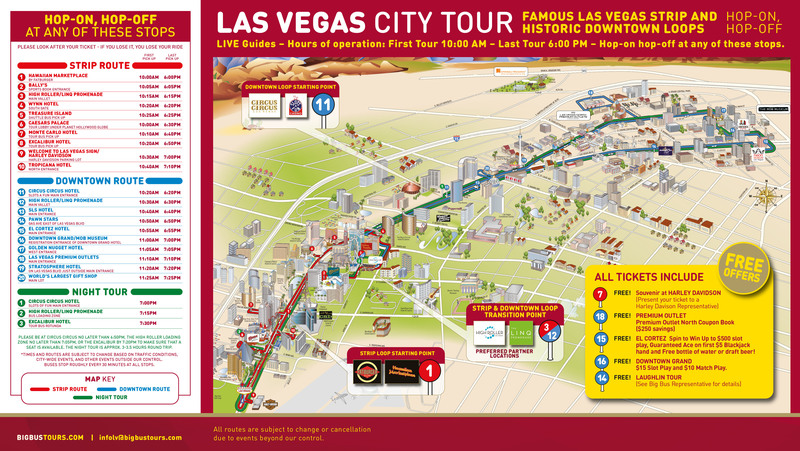 The Big Bus Tours - Las Vegas 1-Day Hop-On Hop-Off Bus Tour showcases all the unmissable Las Vegas sights. The Downtown Route takes you away from the strip to discover what the locals call “the real Las Vegas”. Highlights include the Stratosphere Tower, Wedding Row, Pawn Stars Plaza, Container Park Praying Mantis, Fremont Street Experience and the Premium Outlet North (a must for bargain hunters!). You may board the bus at any stop. The voucher can be exchanged at any of the stops directly with the driver. A Child Ticket should be purchased for anyone aged 5-15 years. Children must be accompanied by an adult. Children under the age of 5 may travel free of charge as long as they are accompanied by a dedicated adult (1 adult to 1 child). Voucher information : You must print and surrender a paper version of your booking voucher for this activity (showing your voucher on a smartphone is not accepted). No refund can be given for customers without a printed copy of their voucher. Best way to visit a city!